Many of you probably saw the email from Eric Prill today, about potential issues with paddock space at Indy. In that light, something that we have done in NE (and maybe other places), has been to establish a corral at the Majors. This works well for a number of reasons and is generally a very positive situation. If we could get a group of competitors interested, potentially, we could approach SCCA about getting space together and perhaps consolidating a bit to save some space. If you are interested in doing this, please either send a note to me here or PM me. I'll keep track of those interested. If you PM me, please give me an email and a cell. I don't know for sure if this will be approved, but, it is worth a try. I would be interested in the corral as well. Thanks Al, Matt, and Kim, for jumping in and joining a potential corral! Please others jump in too! I'd like to be able to go to SCCA with at least 10 teams, and potentially 15! I talked to SCCA today and have some updated info for all of you. 1. Please prepare for no electricity, or other services at your paddock site. There may be some minimal capability, but, it should not be counted upon. 2. Next, with all the issues SCCA has with the paddock, they do not think working class corrals is a good plan, so, we should proceed without them. What we can do, is once paddock maps are out, with manufacturers and vendors placed, we should be able to see locations and we could potentially, coordinate on our own to try to paddock together. I'm willing to keep an eye on this and make suggestions, others can do this too. 3. There probably will be tiered registrations and paddock sign ups, mostly yet to be defined. Think of it as registering but signing up for a paddock space probably a couple of weeks later. SCCA is planning a trip there this coming weekend to better understand and map the situation to complete their planning of the paddock map. Please continue to let me know if you are interested, I do have a list that I am compiling and will be glad to add to my list. Update on paddock info. Apparently during registration, you can indicate you want to paddock with a friend. I don't know if you can say more than one friend, but, I will check. Keep letting me know if you are interested in the corral. Just read this, and it says that no tow vehicles or motorhomes will be allowed in the paddock areas if you have an enclosed trailer. 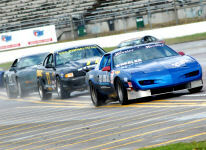 Do folks really believe that SCCA will strictly enforce that rule? I kind of have a bad feeling about this, and that those folks with ins will get MH or tow vehicle space, and others will be left out taking shuttles to their tow vehicles or campers.